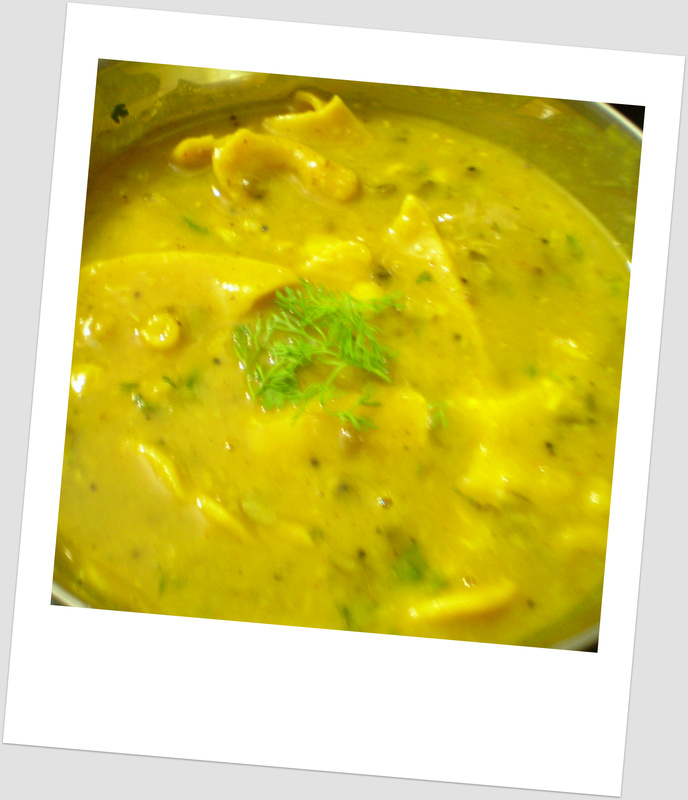 I have had varied versions of the dal dhokli in Gujarat, Maharashtra and Rajasthan. But the basic recipe- dough rolled and cut into diamond/square pieces and cooked by dropping it in boiling liquid-y dal made out of red gram dal (toor dal) and spiced with mustard, tamarind and sugar/jaggery. The way I make it, is by slightly modifying my mommy-dear’s recipe. When binding the dough, I use a mix of whole wheat flour and gram flour (besan) and I also add some garlic to the dal. If you know how to make gujarati dal or the maharashtrian aamti, all you need to do is mix 1 part besan with 2 part whole wheat flour, season with salt and red chilli powder, add a tsp of oil to the dough and bind it with water. Now roll this like a chapati, cut it into small diamond shapes and drop them in the boiling dal/aamti. Cook al dente just like pasta and serve with a dollop (1/2 tsp!! haha!) of desi ghee! Deliciousness! – Mix all of the ingredients except water. Make a well in the flour and begin by adding a little water to it and mixing it well. Add water till it makes a dense but soft dough. Knead this well for five minutes and then keep it aside. – Roll the dough into chapatis (0.5 inch thick) and then cut it into 1.5 inch diamond shapes or squares or whichever shape you want. You can even be adventurous and use a small cookie cutter for this. – In a tray or on kitchen paper, sprinkle some whole wheat flour and on that put out these diamond shaped dhoklis. – Next, in a deep pan/vessel, warm the oil then make tadka by adding the mustard seeds, turmeric, hing, curry leaves and garlic. Keep the cooked dal ready by mashing it to a smooth consistency well. Add the cooked dal to the tadka, mix well taking care that the dal does not stick to the bottom. Then add the remaining chilli powder, tamarind and jaggery. Adjust the thickness of the dal to pouring consistency (remember that the dal will thicken further when you add the dhokli to it). Bring the dal to a boil and then add the ready dhoklis to this and boil this mix till the dhokli is cooked al dente (this you can test by inserting a fork into it or just sampling one by eating it). Ensure that it is well seasoned. – Serve hot by garnishing with some desi ghee and coriander. P.S. : Because the sauce is of soup-like consistency, if you cook this and keep, it will become one huge thick mass. If you have to make this in advance, keep the dal and the dhoklis ready and cook them together just 10-15 minutes before serving. Update: Thanks to Garima for bringing this to my notice. I also add 1 tsp of ajwain (carom seeds) to the dough. Oopsies! This entry was posted in Healthy Recipes and tagged dal, dal dhokli, fresh pasta, gujarati recipe, indian pasta, maharashtrian recipe. Bookmark the permalink. Lovely variation to the one which we make at home. We use split green gram for dal mixed with a little chana dal.No tamarind or jaggery;these are not a regular feature of rajasthani food . For the dhokli we add a little jeera or ajwain to the flour mixture. Its a lovely recipe, my fav for rainy, cloudy day. oh and also we make the dhoklies like donut. Round with a hole in the middle.